In heavy rain we met with Chris and decided after an hour of waiting in our cars that we should have a try at finding some animals. Luckily, we could find two Smooth snakes (Coronella austriaca) underneath the first tin we lifted on one of Dorset’s prime lowland heath land sites. We went on to find an additional 8 or so smooth snakes by lifting tins that had been put there on purpose, as finding these secretive snakes is extremely difficult. Visiting a number of other sites when the rain stopped we saw around a dozen Grass snakes (Natrix natrix), from small juveniles to large adults, as well as a few Adders (Vipera berus) and lots of Slow worms (Anguis fragilis). 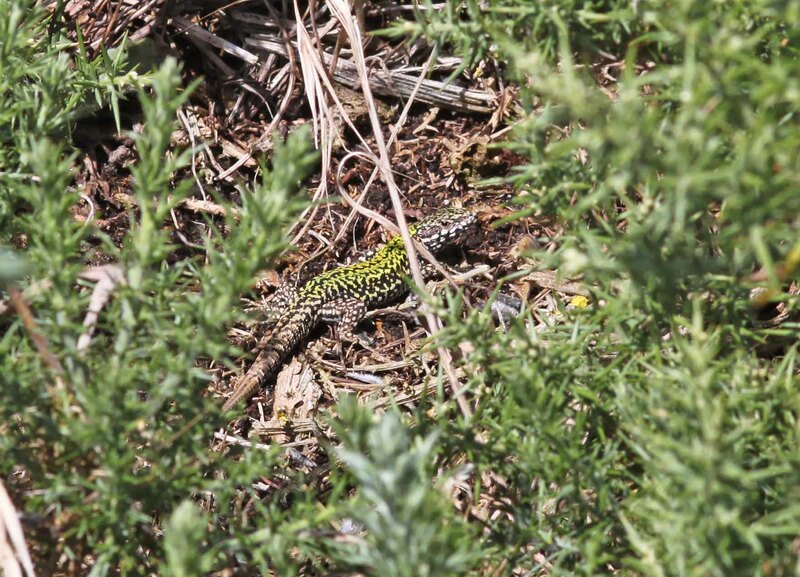 When the sun came out we were able to see two male Sand lizards (Lacerta agilis) as well as Viviparous lizards (Zootoca vivipara). At a coastal site we searched for two introduced species, the Common wall lizard (Podarcis muralis) and the Western green lizard (Lacerta bilineata). Whereas the 5-6 green lizards we saw were very shy, the wall lizards were far more willing to have their photographs taken. 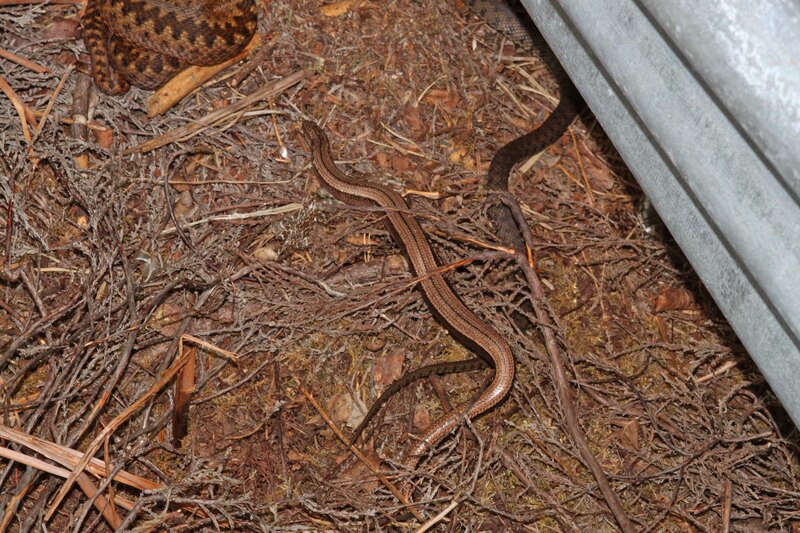 Searching again on some heath land we saw all three snake species once more, including all three under one tin! Later in the evening we planned to meet Chris again around dusk so that we could see some Nightjars (Caprimulgus europaeus). Arriving at the site we could hear several individuals calling and we could soon see these wonderful nocturnal birds flying around hunting for moths, a fantastic sight! Some other birding highlights for me from the weekend include Buzzard, Kestrel, Hobby, Kingfisher, Green woodpecker, and the rare Dartford warbler, but none were as impressive as the Nightjars! On Sunday afternoon we spent an hour searching near Kev and Suzanne’s place before we started our drive back up north. We visited a graveyard of all places and here we found many Slow worms hiding under stones and some tins, as well as Viviparous lizards. Soon afterwards Kev spotted a small, female Adder which is quite rare at this locality. Moving on to another spot next to a river we found another group of slow worms, together with four small Grass snakes and a Smooth newt! Not bad for an hours searching in the UK! After this we said goodbye to Kev and Suzanne and drove home in the heavy rain, spotting some Buzzards hovering over the motorway on the route home made things slightly less miserable considering the weather. Hi I love the website! I am interested in reptiles and amphibians and I also live in Gloucestershire. I was wondering would you be able to tell me where you saw the reptiles (female adder, slow-worms and grass snakes) It would be great to know what churchyard you were in, what the river is called and at which spot by the river you saw the grass snakes. Thank you very much please can you email me your reply. brilliant … my dad use to take me to Dorset before he passed away to look for reps when I was a kid. now I have kids but I cant remember where it was . please can you tell me so I can show my kids and get them interested in reps . it brought me so much joy growing up.